And I've a many curious things to shew when you are there." Spider is the most dangerous eight legged creature that walks the face of the earth. Who does not know what a spider is capable of? Naught one, but the most ignorant. It can hang from the ceiling, fall in your soup, and creep on your bed and under the blanket. It can crawl on your skin and tickle you all the way, or hide in your closet, well hidden during the day. Spider has long fangs and is a venomous bugger; it is aggressive and will readily attack you, if it, you bother. It is everywhere and nowhere, for often you cannot see it, yet it watches you, for it has six eyes – every eye staring right at you. What made a spider so special, so dangerously beautiful? It has six eyes (or eight), two fangs, long spinnerets and many hands. It has a mind of a hunter – a stalker and an ambusher – a predator who is as bright as a tiger. It is fast and quick, superb jumper. It is cryptic and colorful, buoyant and patient. It is but a son and daughter of mother Earth. As they say, beauty lies in the eyes of the beholder. In case of spiders, it’s the creepiness that surpasses its beauty for many who fail to understand them well. Spiders are one of the thoroughly studied animals in the scientific world. There are about 40,000 described species (Wikipedia) spread into 109 families worldwide; in India, there are 59 described Families (Silwal, Molur and Biswas, 2005). In here, only 19 commonest families seen in and around Mumbai have been listed. 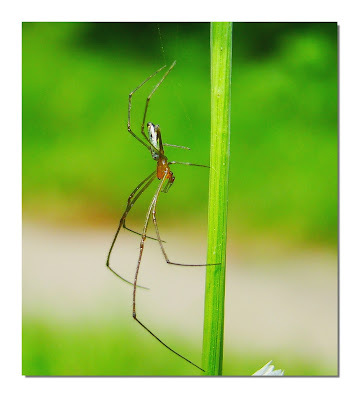 I am not relying on binomial names for some spiders merely identified through photos, but if you know a certain family of the spider by just looking at it, you can gain a whole insight into its short, yet far more adventurous life as compared to ours. Over many years, spiders have fascinated me just the way the butterflies did. This animal with six or eight eyes placed like a crown of black beads on its head is a hunter, a killer. Yet there are subtle behaviors, there is romance, there is dancing and a very patient soul. If you look into the eyes of a spider, you don’t see a genetically automated animal – you see an individual, a personality that has evolved over 200 million years. Let’s count it in digits, 200,000,000 years. We, as a ‘modern’ man, are much, much younger compared to this ancient group of Arachnids, yet we seem to overlook them as a mere specie in this vast biodiversity of our planet. The Spiders prefer various habitats, and knowing the habitat that a certain spider prefers, it becomes one step easier to find one. In Mumbai though, the habitat does not change as much, and hence spiders can be seen over various locations, in your balconies, backyards and the forestlands. The sixteen families listed here are easy to locate, easy to identify and easy to photograph. Most are seen only over a certain season, while some occur throughout the year. Some are rather difficult to find, and there are others that live in our houses, yet we do not notice them. I openly admit, I may have missed several family of spiders that are much common than the ones mentioned here, but I must have only overlooked them. Besides the spiders we’re about to see, there are some, rather uncommon ones seen around, for instance the Family Theridiidae is a rather common family, but hardly ever noticed. Then there is Theraphosidae family, famed for Tarantulas, common, yet not-so-commonly sighted across Mumbai. There is Corinnidae, often small, and confused with Clubionidae. Ctenidae, Deinopidae, Dictynidae, Linyphiidae and Zodariidae, are amongst others. There might be some I never noticed at all. 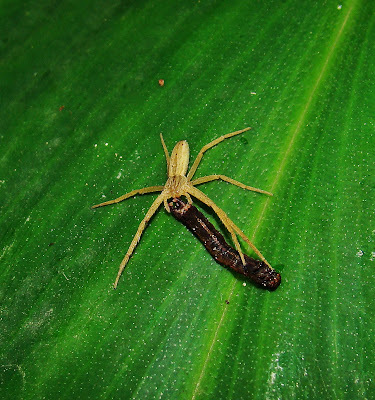 On a broad introduction to Spiders, I suggest you visit The Ultimate Spinner - Spiders. 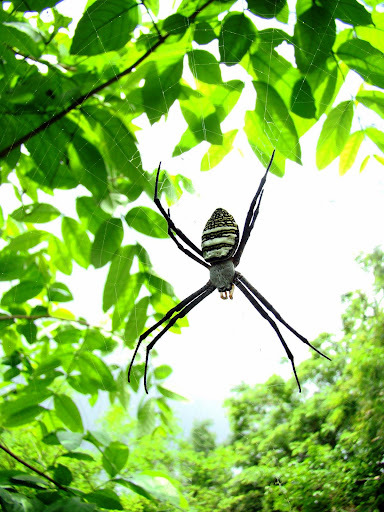 Whether you are in your backyard, at SGNP, Yeoor, Nagla Block and other parts of SGNP, or on the outskirts of Mumbai, spiders are a common sighting. Whether you like them or not, they are ever ready to welcome you with a wide spread orb-web on the forest paths, or by crawling on your shoes in the leaf litter, whether you sit on a rock, they’re sitting right beneath that rock, or whether you brush through a plant, they’re there, already jumping off the leaves for their lives. Or there are some you may find flying in the air, and some sitting pretty on a flower, or some resting comfortably on the surface of the water. If you have an eye for nature, keep it open for spiders. Spiders are a great subject for photographers. If you happen to like nature photography, it is impossible not to shoot these beautiful critters. Salticidae: A very commonly found spider family, they are omnipresent in homes as well as dense forests, are easily identified by their stout body and two out of six big round eyes. These are commonly referred to as Jumping Spiders, due to the fact that they can jump over a considerable distance while hunting for prey, exploring a place, or, if scared. 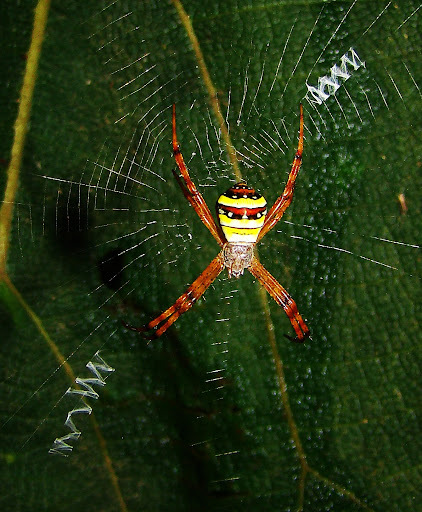 These spiders come in myriad of colors from excellently camouflaging to stunningly beautiful coloration. 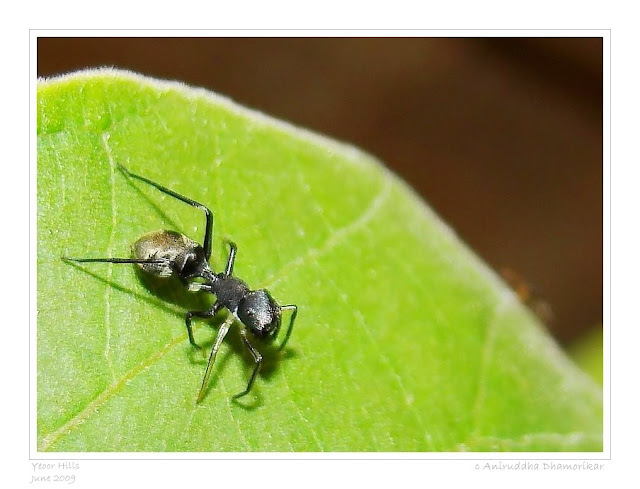 There are plenty of genuses seen in Mumbai, but the most striking is the Myrmarachne, these Jumping Spiders disguise themselves as ants – literally, a spider that looks like an ant, and hence are superb ant hunters. Many species of Myrmarachne are seen in Mumbai. Below are three different species of Ant-mimicking spiders seen around Mumbai. Lycosidae: A spider commonly seen on the forest floor, in the leaf litter or on the boulders near ponds and streams. It is yet another easily identifiable spider family, due to its two prominent round eyes, and four small eyes just below these. They are rather dull in color and rely on camouflage for ambush hunting. It also supposedly stalks its prey, and is usually seen scanning the forest floor. 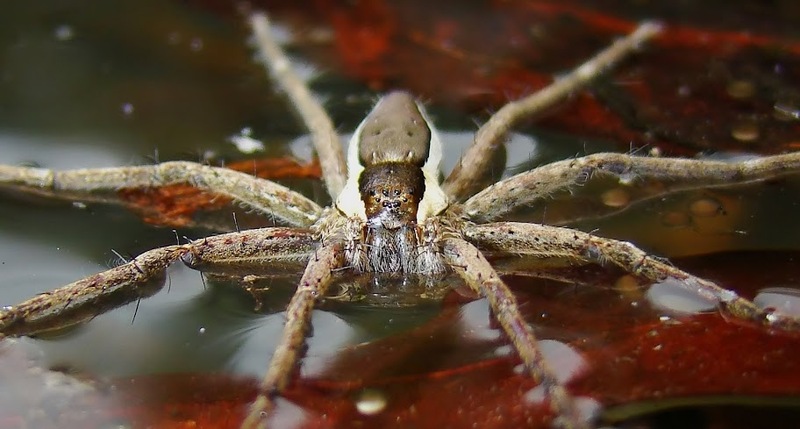 These spiders are commonly called Wolf Spider, since, they were thought to stalk their prey just as the wolves did, but in reality, these spiders rely on ambush, and hunt by surprising the prey. They, just like the Jumping Spiders, do not build web and wait for prey. Instead, the web is only used as a ‘safety-line’ while travelling from one place to another, or for building a nursery for laying eggs. Wolf Spiders are easily confused with Wandering Spiders (Family Ctenidae), which are common, but not as abundant as Wolf Spiders. 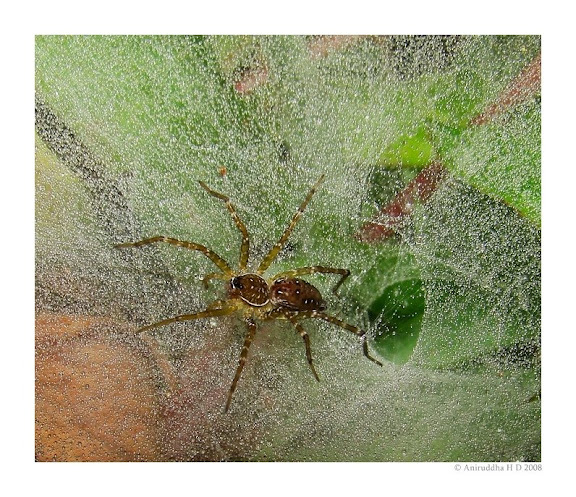 Tunnel-sheet Spider is a Lycosidae belonging spider, that spreads a sheet of web, and lives in a tunnel made by the web. It is often called as Funnel web Spider, which is the actual common name for the spiders belonging to Hexathelidae, which occurs in India, but is a relative of the tarantulas. Oxyopidae: Commonly called Lynx spiders, these rely on their camouflage and patience to catch a prey. They are mostly found sitting on flowers and leaf surfaces, waiting for prey to stop by. These have rather small eyes and hence not easily observable to a naked eye. The legs, however, are the key to identify these, since they are slender and spiny, i.e. literally like thorns of a cactus, and not hairy. Also, two thin dorsal lines run down the abdomen, and the cephalothorax is roughly rectangular in shape. These spiders come in various colors, from deep pink, to green and brown. They are very common during Monsoon months and fairly common during the dry season. 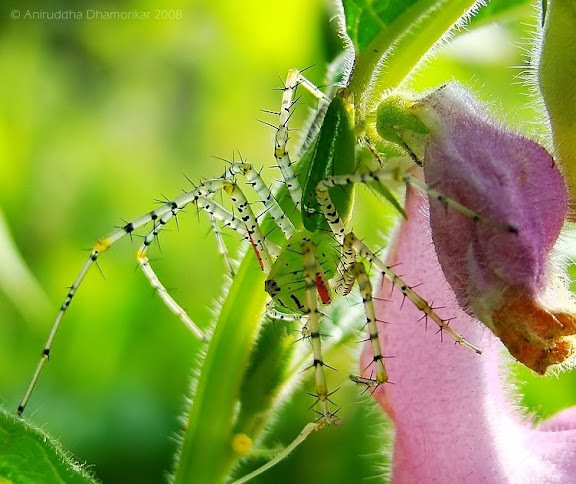 The genus Oxyopes (about 6 or more species) and Peucetia are generally occurring in Mumbai. Tapponia genus is also seen during post-monsoon period. Lynx spiders also do not rely on web, and rather sit and wait for prey to come to them. However, the females use the web to build a nursery for eggs. Araneidae: One of the easily recognized families of spiders, thanks to their Orb-webs, these spiders are one of the marvelous web builders. But don’t go by those easily recognizable orb-webs, for it is also built by other family of spiders, which we will discuss shortly. There are many species in this Family; commonest and easily recognized are the Garden Orb-weavers i.e., Neoscona sp., with a typical “cross” mark on the oval, eggshaped abdomen. However, these spiders are also difficult to identify up till species level due to a vast array of color morphs in a single species. 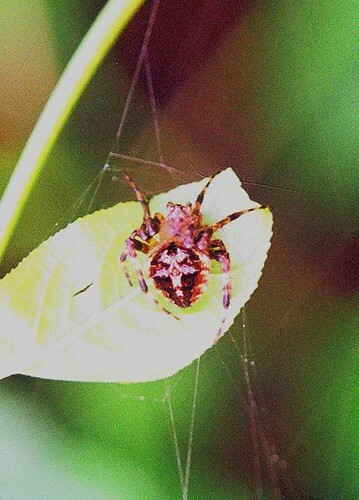 An old SLR scan of a Neoscona sp., showing the typical "cross"
Another commonly seen Orb-weaver is a Signature spider – Argiope sp., common throughout the seasons in forests (several species). These spiders are rarely seen in cities, rather common in suburban areas, and abundant in forests. Easily identifiable due to their zigzag satbilimenta, the fuzzy zigzag web seen near the center of the orb-web, and their typical “X” shaped sitting posture. Gastracantha sp. are not as common as Argiope and Neoscona sp. 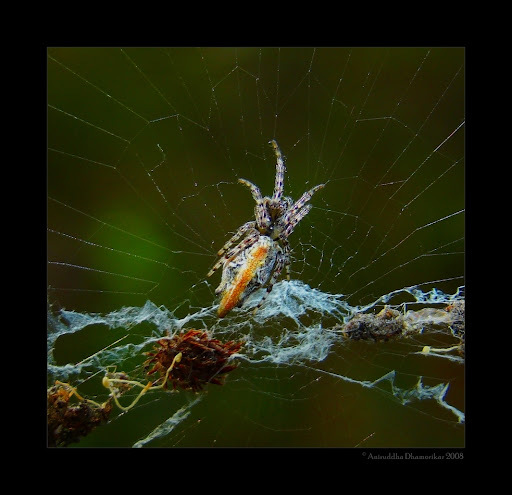 Other, beautiful and not-so-common, are the Spiny Orb-weavers, Gastracantha sp., which happen to be most colorful and vividly shaped, often with spines over the abdomen, and a variety of different shapes. Some other common genus occurring here are Cyclosa sp., or sometimes called “Debri-collecting spiders”, these spiders collect debris, such as dried plant materials, seeds, and even insect parts. It then binds all of these in a line at the center of its orb-web, with the help of stabilimenta, and resst in between this collection, well camouflaged and nearly impossible to sight. These spiders are generally small, less than a centimeter long. 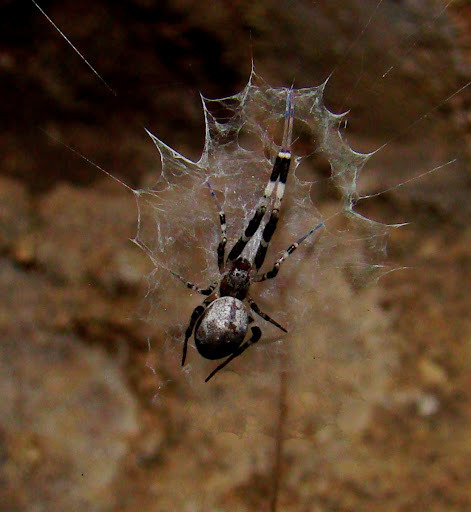 Their orb-webs are also much smaller, and hence not easily seen. They prefer building webs in thickets, bushes and seldom in openings, but never above waist level. It sometimes becomes difficult to see the spider in its collection of debris. Another, commonest species seen – in your balconies or most dense forests – are the Cyrtophora sp., commonly called Tent Spiders or Dome Spiders. These spiders do not build an orb-web; in fact it does not resemble an orb-web at all. These webs, however, are much complex than an Orb-web, and resemble a tent or a dome, hence the common name. These spiders are through to be the ‘precursors’ to the now orb-webs. The spider, after building a web, rests right inside (in the center) the dome, and is a patient hunter. 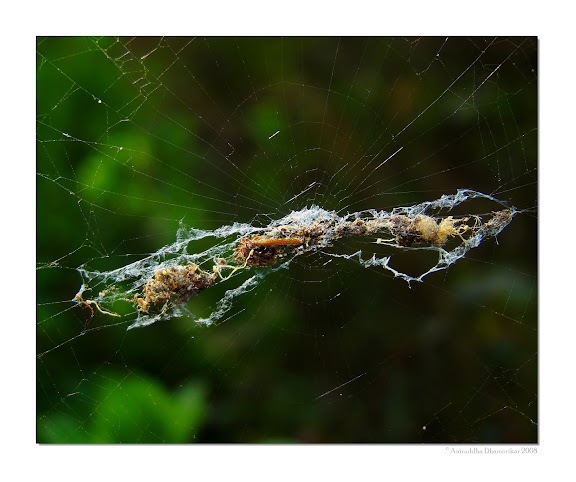 As the web gets older, the spider cuts and sheds it, and builds a new one. It is easy to identify this spider in its tent shaped web, since the web itself is its identity! 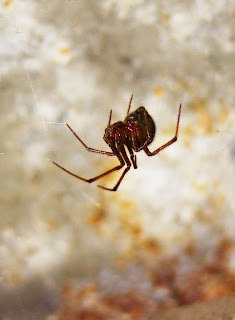 It is, however, not so easy to distinguish it from other orb-weavers, since it has similar morphological characteristic. It can also be confused to Tetragnathidae spiders, if the spider is seen without its web. Some uncommon ones that are seen in the region are Arachnura sp., Ordgarius sp., and Poltys sp. Tetragnathidae: Commonly called “Long-jawed Orb-weavers” these, as the name partly suggests, build an orb-shaped web, yet, these are not the original Orb-weavers. They go by their name, though, since they have longer pedipalps and chelicerae, “long-jaws” that build orb-webs. However, the orb webs built by these are usually at an angle, or horizontal. 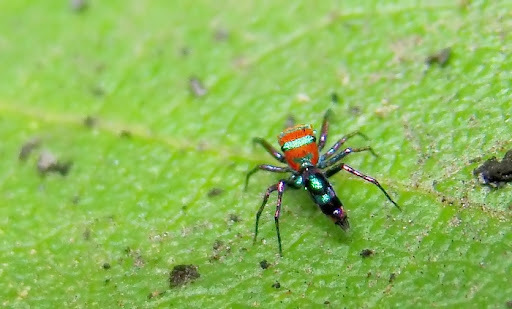 There are several species seen in Mumbai, of which Leucauge sp. (pictured below) is most common. These spiders start to appear as monsoon wanes, and are most abundant during October, through winter and disappear by summer. They build a horizontal orb-web, and are beautifully colored, from green to brilliant orange. These spiders are commonly called “Orchard Spiders”, and, without their web – can be easily confused with Tent Spiders (Cyrtophora sp.). 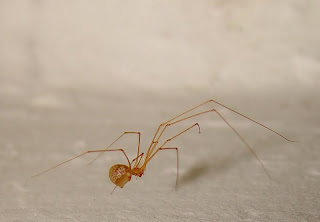 Another commonly occurring genus is Tetragnatha, these are usually small, very slender, with an elongated abdomen, and these also build orb-webs, but are usually at an angle. These show the typical “long-jaws” and are common through the wet and dry seasons. 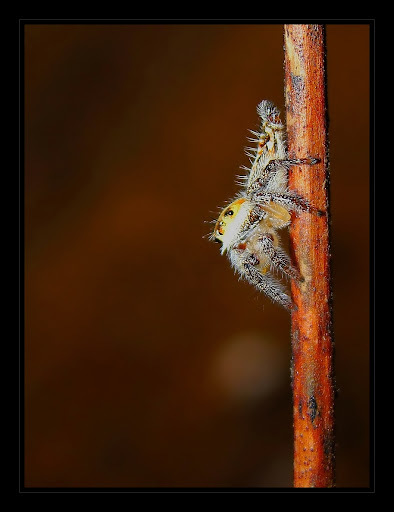 These spiders are mostly small, hence the eyes are not visible to the naked eye, and therefore cause much confusion with the Araneidae family of spiders. However, as discussed above, it generally relies of the position of the webs, absence of stabilimenta, and long pedipalps. One, common and an unusual spider, often confused with the Araneidae family of spiders is Herennia ornatissima, the Ornate Orb-weaver. It is another unusual orb-weaver that builds an orb-web on the surface of the tree trunk. I have only seen one individual at Yeoor Hills, but have no photographic records of any. Pholcidae: Who does not recognize these spiders? Surprisingly, many don’t recognize by its family. These are the famous “Daddy-long Legs” of the Spider World! These are the ones you will most commonly observe in your house, rather than anywhere in the woodlands. Go to the corner of that room, see that messy thin web? On it rests a creepy, long legged spider with a tiny abdomen, and an invisible head. Yes, this is the family of Pholcidae – the spiders we strive hard to remove from our homes, and yet they end up coming back. These, easily identifiable spiders are a doom to an aesthetically beautiful architecture, but the webs that these spiders build, although random and haphazardly built, are good air filterers. What’s more, these spiders never get caught in their own webs! 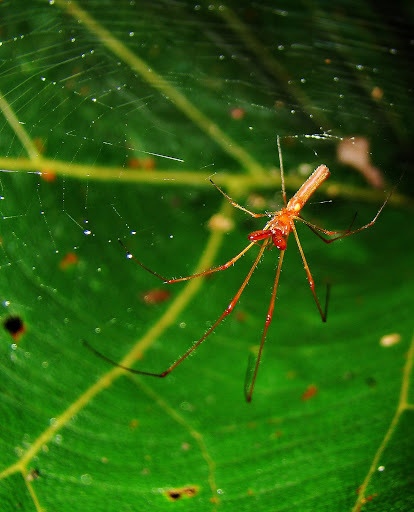 These spiders capture mosquitoes, flies and ants that bite, hence act as good neighbors! But the aesthetics come first; hence these spiders are considered pests at homes. I have observed these spiders to be rather weak and thin inside homes, and their brothers and sisters can grow to an impressive size outside, where the prey is more abundant. Oecobiidae: We all know these spiders, and hate them as much as we hate the Pholcidae spiders (discussed above). 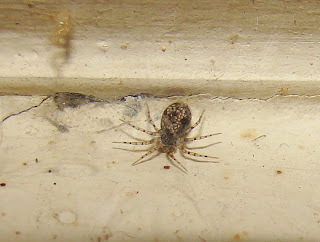 These are small spiders, barely measuring a centimeter, that love to live in corners of our homes. They build a small, oval thin sheet of webs and rest inside it, waiting for prey. They are more so common where the corners are not cleaned, and are pretty fast if disturbed. These little spiders capture prey, and spin web around in circles, and retreats into its tiny web house. Looking up at these is not an easy task, but the shape of the web, and the picture provided above can be of some help. 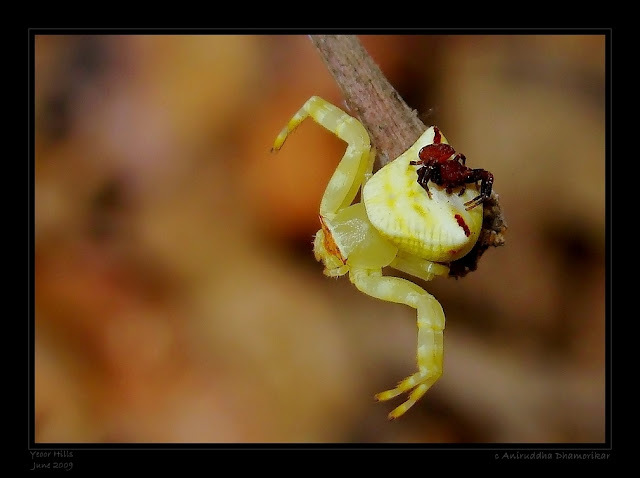 Thomisidae: The infamous Crab Spiders, the masters of camouflage and beautiful colors, are spiders with two pairs of appendages held in front like a crab’s chelicerae, hence the common name. This is actually, a pose to strike the prey or to defend. These are rather common on flowers, leaves and seldom occur on non-natural structures. It is generally the females that we see commonly, and the males are very tiny, a dimorphism very common in spiders. They do not rely on webs, but use it as “safety lines” and to build a nursery to lay eggs. The most commonly occurring genus is Thomisus sp., which are large and commonly seen in urban gardens. Other genus, although difficult to see, are Ozyptila, Pistuis and Diaea are also common, yet difficult to sight. 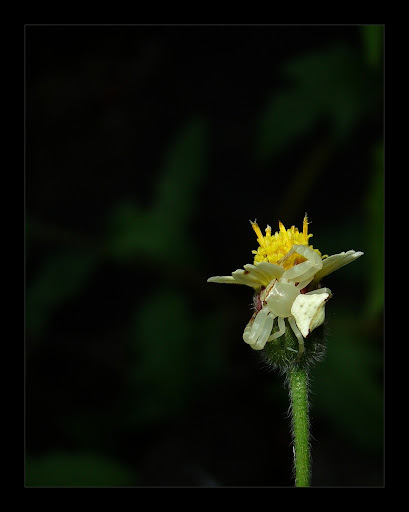 Two of the rather interesting ones – that are not the typical crab-spider looking crab spiders are Runcinia sp., which has a rather elongated abdomen, and Amyciaea sp., the ones that mimic ants – usually Oecophylla smargdina (Weaver Ant), both of these are seen in Sanjay Gandhi National Park. 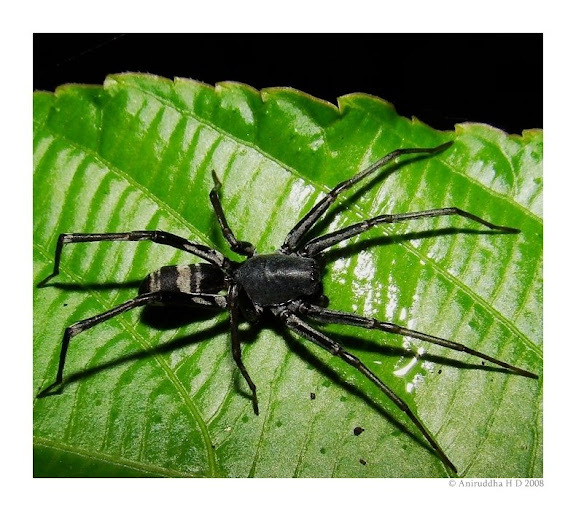 Hersiliidae: The “Two-tailed Spider” is a common spider, found on tree trunks and sometimes on wet walls. 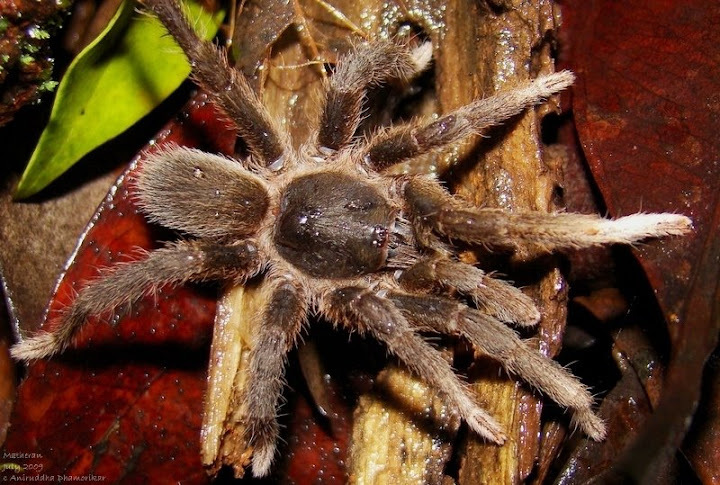 It is called so because of its two extra-long spinnerets that appear like tails. 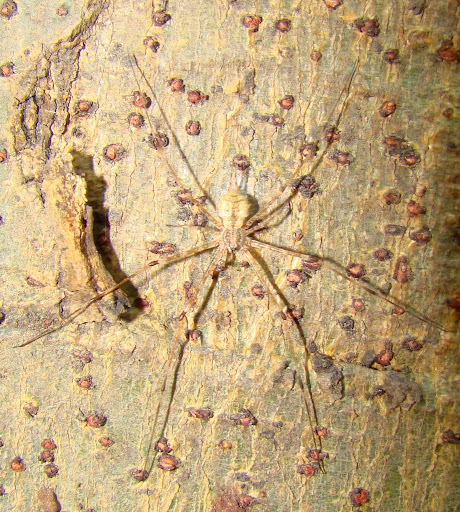 This spider is not large, but has considerably long feet, and stays motionless on the tree trunk, awaiting the approaching prey. 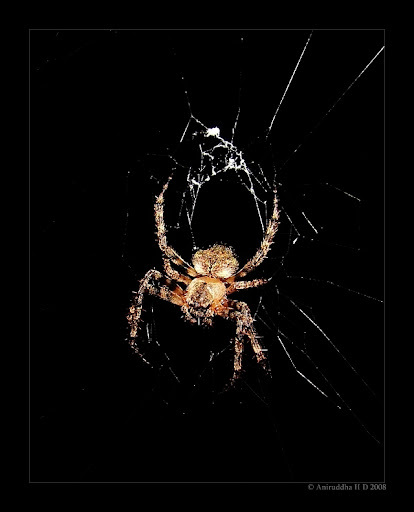 Once the prey is close enough, the spider strikes with a blinding speed, and spins web all around the prey in a circle. This spider also does not build a web, but uses it to wrap prey and to build a nursery for eggs. 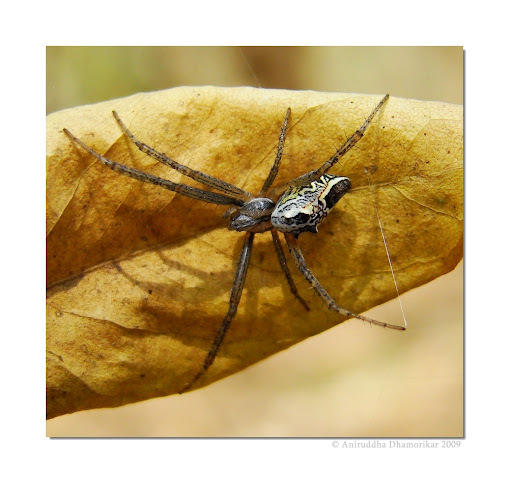 Scytodidae: A common, yet uncommon spider of Mumbai forests. Seen exclusively during monsoon seasons, it is a mystery where they vanish as soon as monsoon ends. These spiders are very unique, and their mysterious disappearance only adds to this uniqueness. These spiders are called Spitting spiders, and “spit” out web from two glands just beside their mouth, and, this silk is coated in venom. The spider does not bite and then inject the venom, but shoots it at a short distance, and pounces on the unlucky prey. It has long legs, much like the Pholcidae spiders, and uses its extra long first pair of appendages to judge the distance between itself and the prey. Only one genus Scytodes is found here, which are somewhat orange, with a light orange, striped small abdomen and a rather flat but dome shaped cephalothorax. These spiders rest in folded leaves. It appears with the onset of monsoon, and as soon as new leaves open. As the monsoon proceeds, their size increases, and become more and more common throughout the forest trails. Yet, as soon as the leaves dry, they vanish. During their time, it is not uncommon to find two spiders in one folded leaf – perhaps a pair? Gnaphosidae: Ground Spiders belong to this family, and are common throughout Mumbai, be it in your backyard or the forests or a rocky terrain. They are small, dark brown in color and quick runners. 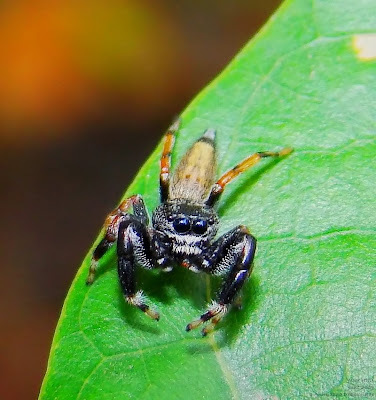 They appear more or less similar to jumping spiders (Salticidae), but are less hairy, with longer, fat legs and the two spinnerets are visible at the end of the abdomen, but their striking similarity is shared by Zodariidae. 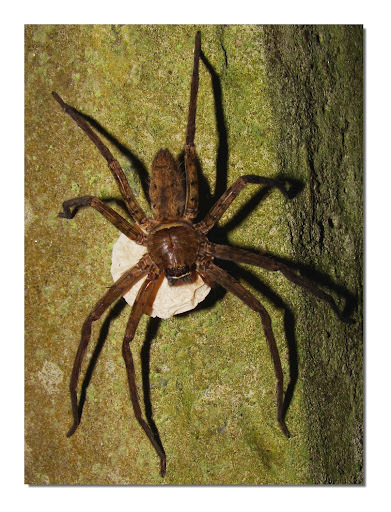 Sparrasidae: The Huntsman spiders, belonging to the family Sparrasidae, are large spiders, and are rather commonly seen in homes and suburbs, than in forests. This could be because of their cryptic coloration, and nocturnal behavior. They may appear like Wolf (Lycosidae) or Nursery Web (Pisauridae) spider, but are considerably different if looked closely. These have a different eye-pattern, body pattern, and as well as prefer different habitat. These are commonly seen on walls and tree trunks or on/ under rocks. They are also called Giant Crab Spiders, but are in no way related to the real Crab Spiders (Thomisidae). 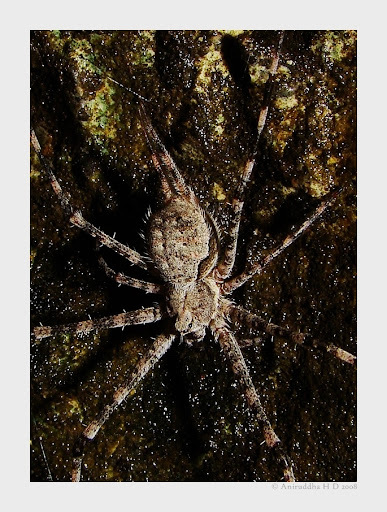 Pisauridae: The Nursery Web Spiders or simply Water Spiders belong to this family. These are unique spiders, as all spiders are! 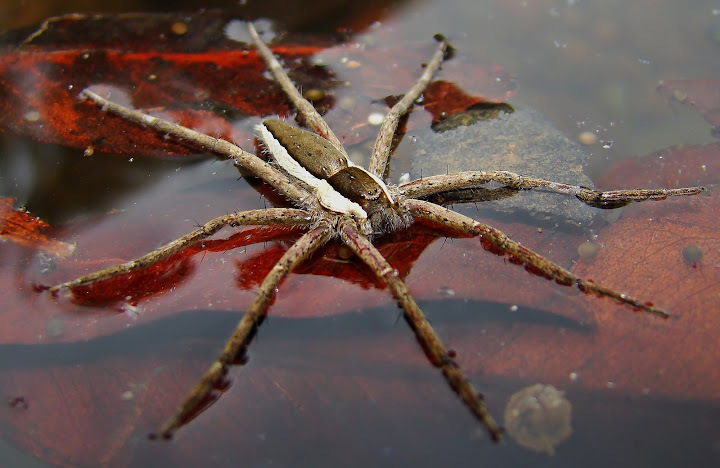 They go by latter name of Water Spiders since these are mostly seen around waters, and sometimes onto waters, but it is not uncommon to see them on forest paths. 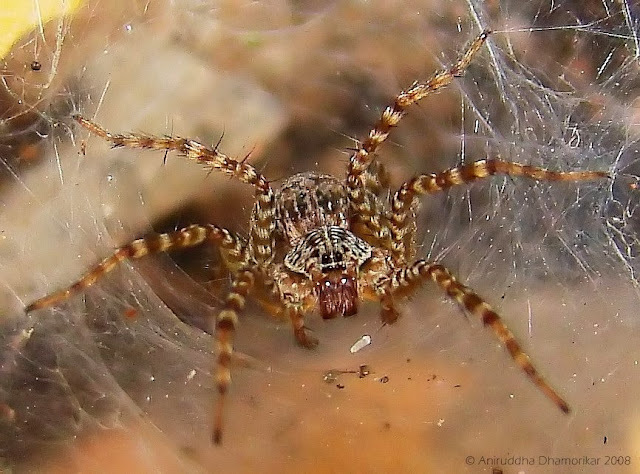 The name "Nursery Web Spider" is not true to the Indian species, since only a European species, Pisaura mirabilis builds a nursery for the spiderlings. They are often confused with Wolf Spiders (Lycosidae) but the easiest way to distinguish is the eye-pattern. 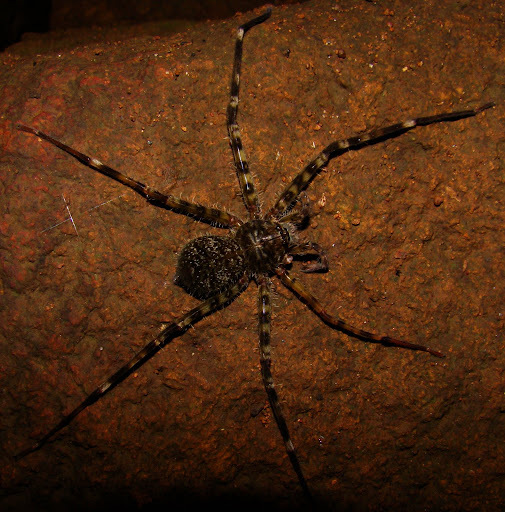 These spiders are called Water Spiders because they hunt under water! They can maneuver themselves onto the water surface, and a fish or an invertebrate swimming by is attacked. 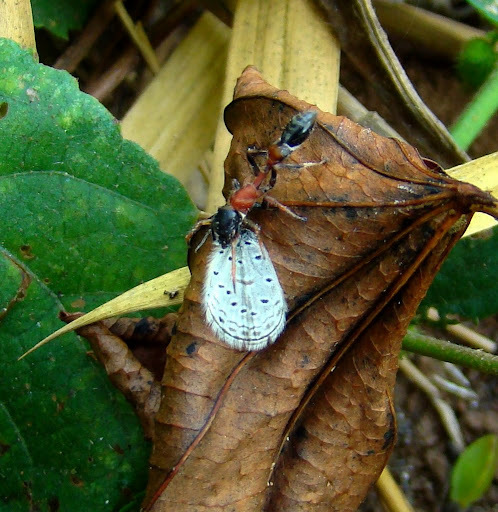 Thalassius is the most common genus that occurs around Mumbai. Clubionidae: This is a confusing family of Spiders; hence I shouldn’t really be talking about them here. These spiders are off white in color, and rather faintly red. 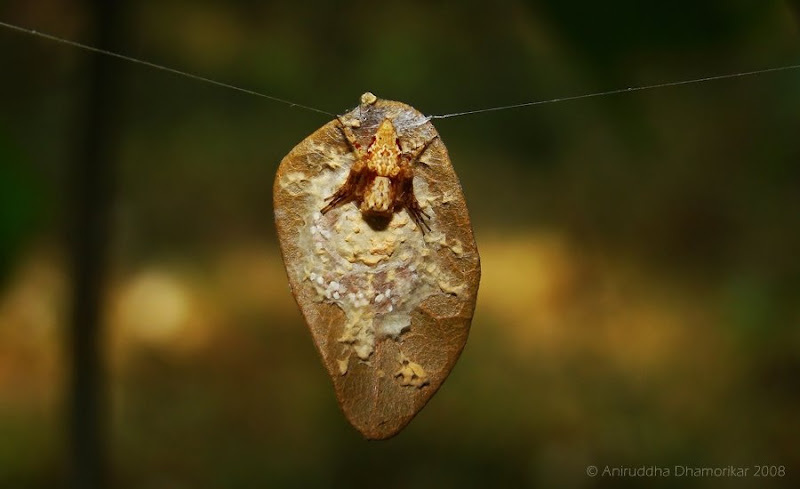 They tend to roll the leaf/leaves and spin a web on the inside to rest. They have big fangs compared to their body size, and are seldom seen out of their retreats. 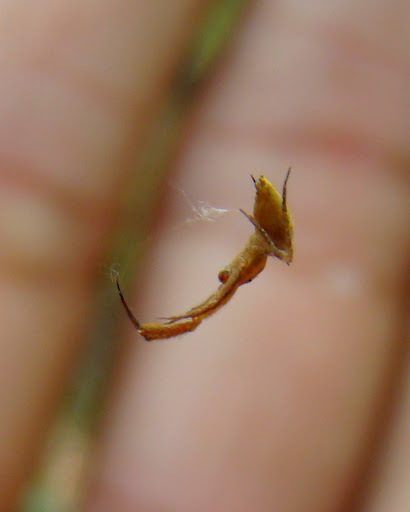 Uloboridae: Yet another unique family of spiders, these are called Hackled Orb-weavers. Now these are also confused with the Orb-weavers of the family Araneidae, however, these spiders have a distinct, random hackled web around the center of the web. This hackled structure is different compared to the Signature Spiders as well as the Cyclosa sp. discussed in the Araneidae family. These spiders are not special because they build a hackled orb web. It is because of something rather surprising… these spiders are the only spiders that are non-venomous! They, however have a special web-spinning apparatus which produces this hackled web, that aides them to capture the prey more efficiently, without the use of venom. These spider are very small, and may appear to be an Araneidae belonging orb-weaver, however, it has a rather distinct, long and large first pair of appendages which is the key for its identification. Seeing them is tough, thanks to their small webs, and even smaller sizes, but once you see and recognize them, you won’t forget them ever. These spiders remain well camouflaged and tend to prefer dark places. 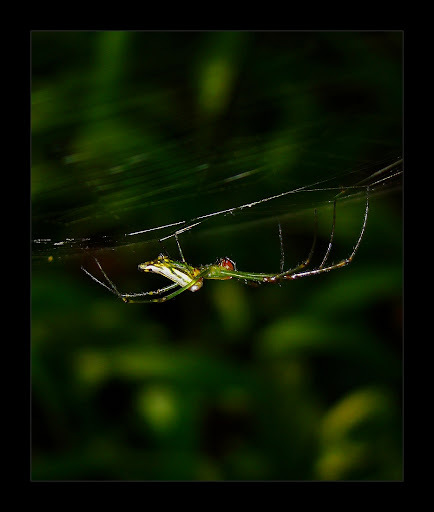 Nephilidae: The Golden Orb Weavers or Giant Wood Spiders that rein the forests around Mumbai come from this small spider family, Nephilidae. These spiders are orb-weavers and were formerly placed in Tetragnathidae and Araneidae. These spiders make largest orb-webs in the world, and have the strongest webs than any other spider species. They are abundant during post-monsoon months, and throughout the dry season. They tend to disappear during monsoon and many young spiderlings are seen as monsoon starts waning. 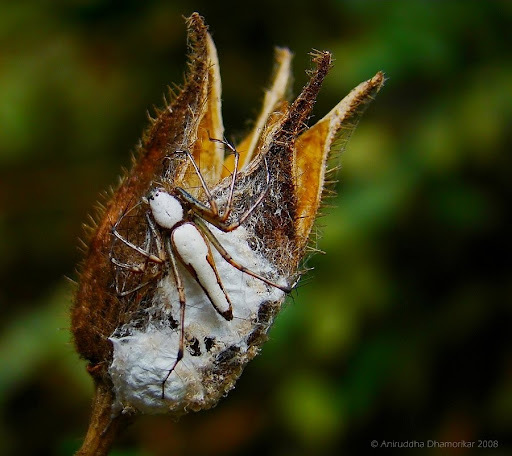 Theridiidae: This is another common family seen around Mumbai, and are sometimes referred to as Cob-web spiders. Their webs are dense, appear messy and are often regarded dirty. But these webs are more like a maze, and only the owners of this maze never get tangled in it. The web is built in three dimensions, and often contains several layers of thin sheets of webs. These spiders are commonly seen in and around suburbs, and more so in abandoned houses. The spiders are not big, and prefer dark corners. There is no easy way to distinguish them from others, but this might be of some use if you were to be locked in a room full of Theridiidae spiders. Philodromidae: Commonly called Running Crab Spiders, they are thought to superficially resemble Thomisidae, but look more like Pisauridae spiders to an untrained eye. Easiest way to distinguish these spiders from the above mentioned families is their rather flattened shape, the eye pattern which is similar to Thomisidae, and the second pair of legs that are longer than the rest. They are usually seen in grasses and on leaf surfaces closer to the ground. I had overlooked this one as a Pisaurid spider, but only after some close inspection can we see the difference. These are but the families I have been coming across on most nature trails. I am sure there are other families, perhaps more common than the ones mentioned here. There are some spider families that are very confusing, even to the scientists, that it becomes hard to identify a spider completely. 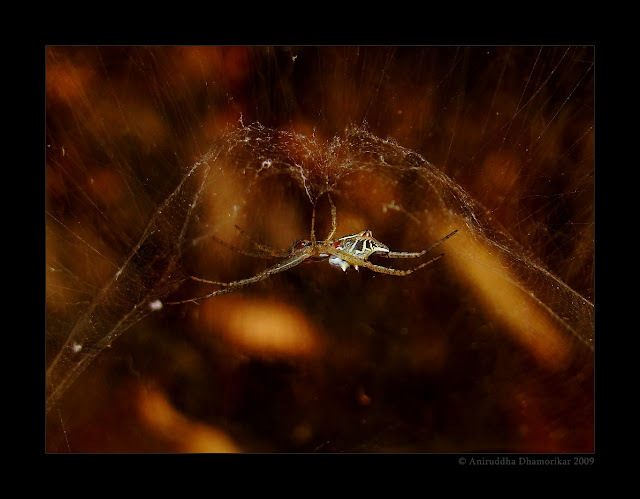 The spider families of Mumbai are diverse, in their habitats, their behaviors and even in the names. Understanding them will not only help us know our neighbors that dwell in the corners well, but also broaden our sense of sharing a tiny space with such creatures. We must not forget that they lived here long before we did, and it is their right to live wherever they wish. Keeping houses clean is not bad, but killing the ones that live in the natural habitat – in your backyard, for instance, must be discouraged. 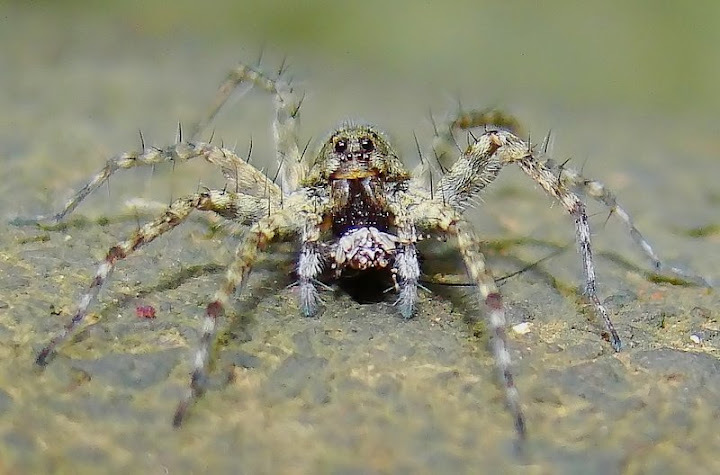 I did not include Theraphosidae in this ‘commonly’ occurring families of spiders since, although common where they are seen (SGNP, Matheran), they are not as abundant and are not seen regularly on nature trails. Another rare or uncommon family is Deinopidae, a unique family where the spiders have mastered the art of “web-casting” the prey. 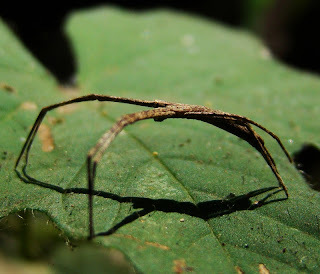 I have seen only one in SGNP, Deinopis sp., it is a very well camouflaged, small spider, hence perhaps not seen so commonly, and can be confused for Tetragnathidae (if seen without its web). Deinopis sp. seen at SGNP: the resemblance is similar to Tetragnatha sp. Other families that might be common, but confusing to identify are Dictynidae – which can be confused with Gnaphosidae and Theridiidae, Hahniidae – perhaps confused with Gnaphosidae, Linyphiidae can be confused with Theridiidae, Ctenidae can be confused with Lycosidae and Pisauridae, or even Theraphosidae, Coriniidae – confused with Gnaphosidae or Clubionidae, even the common families can be difficult to distinguish merely on their morphology, such as Araneidae from Tetragnathidae, or Theridiidae from Linyphiidae, or Corinnidae and Zodariidae with Gnaphosidae and Clubionidae, and so on. Identifying spiders is not an easy task. It is a task that requires patience and the skills of dissection. Only by observing a spider under a microscope can one be certain of its specific name, and sometimes just the family. Arachnologists are still baffled by the sheer number of spiders all across the world, and are yet struggling to classify them, often coming out with rather surprising results, and often new families. I welcome suggestions and critiques in this little effort of calling these spiders ‘common’, and appreciate any recommendations and corrections to further better my understanding. Another interesting spider family is Eresidae - where there are several species that are "social", in the sense, these spiders build a vast web on trees, by webbing together live and dead leaves. This spider colony is commonly seen during monsoon and post-monsoon, and really resemble a haphazard, messy tangle of webs and leaves. I do not have a picture of these spiders and their webs, but it is easy to identify by it's appearance of a tangled web of silk and leaves - distinct from the nests of the Weaver Ants. As a nature enthusiast, this is just a summary of the vast spider diversity of Mumbai, so significant to the ecosystems and its survival, that every spider killed is a mosquito freed! Araneae: Largest order under Arachnidae, housing all the spiders. Spinnerets: A silk spinning organ located at the tip of the abdomen. Stabilimenta: A type of silk that is fuzzy and hackled, containing many tiny silk strands. However, I am a bit surprised you didn't photograph Neoscona sps. which are quite common in SGNP. But then I haven't spotted some of your spiders in the last two years that I have been watching them. Quid pro quo, I guess! For a novice in spiders like me this is really a learning lesson no.1. It has been compiled so nicely. And great pictures to illustrate the species. Kudos to you. This a very interesting documentation. Who would think of this spider diversity in a city of monies!!! Thank you for looking, everyone! This is very informative and enjoyable too. Excellent work! Thanks. From across the Indian ocean, thanks from a South African web surfer. You have some fine photos and some very good text. excellent compilation, thanks for that, This makes identifying some of my macro spider images (http://naturemagnified.blogspot.com/) easier. hey Anirudhha ! 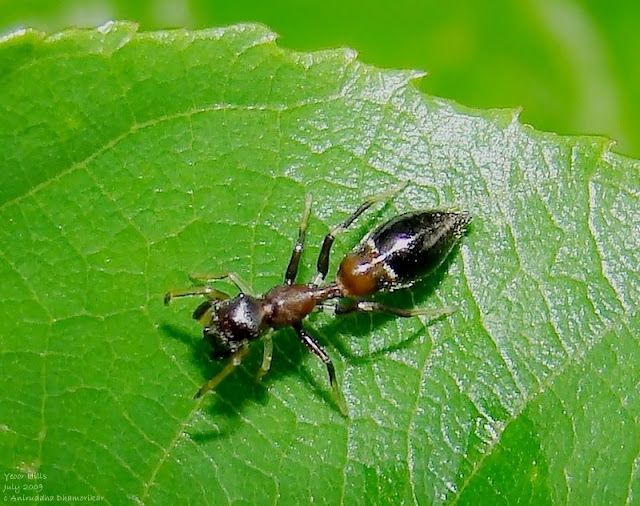 nice work but isn't Tetraponera rufonigra a Ant and not a Spider ? That is right Aditya, I have said, it is a T. rufonigra (ant) mimicking spider. In other words it mimics T. rufonigra ant. Thank you for compiling such an excellent and interesting blog. 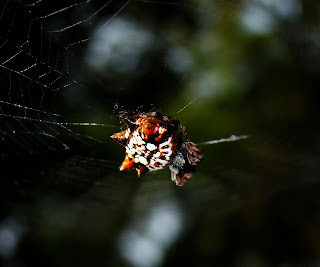 I had photographed a Cyclosa sp. without knowing what it was and had sought help in identifying it through my photo forum, when another member directed me to your site. My photos of the spider are here: http://forums.steves-digicams.com/panasonic-leica/180614-curious-find.html. May I know the make/model of your camera? Your pictures are fantastic. 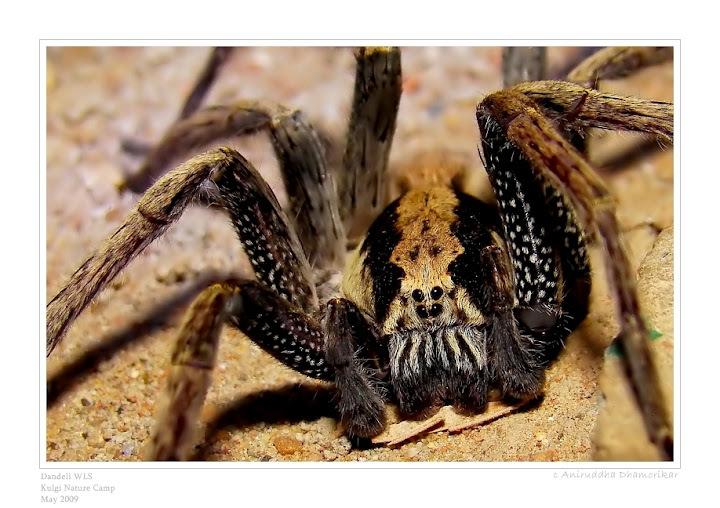 While searching for some spiders' photos from India for school children, I came across your article. Its wonderful, well written with interesting photos. I hope you wouldn't mind if I copy a few photos. Thanks. You can definitely use it for educational purposes, Aditya. I'm glad you find it useful. Holarchaeidae, Uloboridae and Mesothelae all lack venom. Any spiny back spider found in raigad dist. ? Dear Deepak, only "spiny backed" one found in Raigad is, I think, Gasteracantha sp. Fam Araneidae, but there could be others. very informative . Thanks for your post! Thank you! Made wonderful reading!